If only every quarter could be like the first quarter of 2019, and no quarter would be like the fourth quarter of 2018! 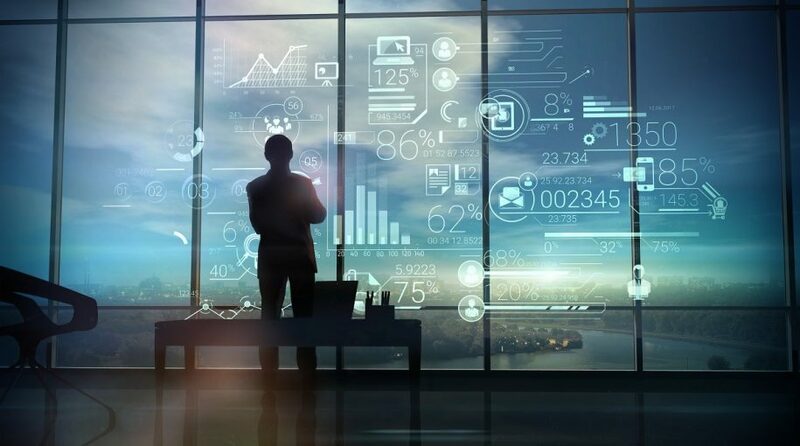 First quarter performance, one of the best on record, failed to make up completely for the losses experienced in the prior quarter, one of the worst quarters on record. Markets became optimistic that a U.S.-China trade agreement allowing global growth to resume was around the corner. If only that agreement were the only thing holding back global growth. The world equity markets are still being propped up single-handedly by U.S. companies. The U.S. was the region that rebounded most strongly in the first quarter, with the rebound concentrated once again in the largest companies and growth-oriented sectors. Small companies in the U.S. were unable to recapture the ground they lost in the fourth quarter, a sign the market is not convinced the economic engine is back at full throttle. International markets continue to lag the U.S. economy. Growth outside the U.S. is elusive and politics increasingly feed a heightened level of uncertainty. Though developed markets are attractive if one judges by valuation, unaddressed past ills will likely limit the ability of these markets to fill the gap. Emerging markets have also remained weak, even as trade fears diminish. We suspect many are concerned by the size of the dollar-based debt that needs to roll over this year. One of our biggest concerns: Interest rates dropped materially this quarter—not a great sign of economic durability. We should expect more volatility in the debt markets as underlying fundamentals argue for much higher rates. Let’s start with an analogy: You give a dollar to a person, with a well-defined plan, to invest for one year. In the end, he needs to return the earnings or losses (minus any fees charged). In addition, he needs to update the market value every day. In this analogy, the dollar is held in a savings account for 364 days. At the end of every day, you receive a report that shows you have maintained the one-dollar value, plus interest. Given the volatility in the public equity market, the stability of this investment provides you comfort. On the last day, however, the manager takes your dollar and bets it on red. Volatility was always there—this was his plan all along—it just showed itself at the end. Although the above exaggerates a point, we are seeing investors move into investment products that appear stable yet carry hidden volatility—volatility that exposes itself at the worst time. To make matters worse, these same investment instruments are typically illiquid; your ability to unwind your investment, even by taking a loss, is often limited. We have stated in the past that complacency mixed with greed is a bad combination. To us, the market’s dramatic drop in December has been forgotten by too many, and greed is back in force. Complacency is also back. 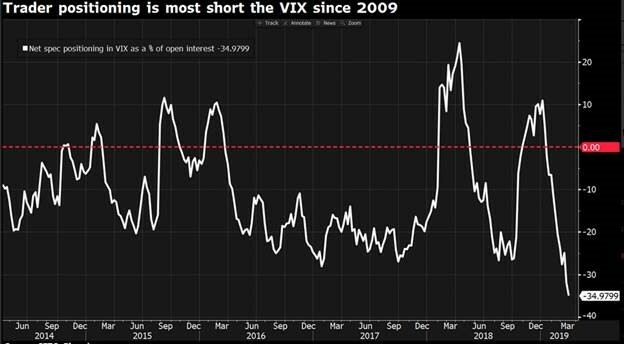 Just look at investors’ large bets (not seen for 10 years) that volatility will decline (from what are already fairly low levels). We find this complacency interesting as we witness a tempering of growth signals. The University of Michigan Surveys of Consumers (in the U.S.) suggests a downward trend in large-purchase buying behavior. The data do not reflect merely trade concerns; the behavior has been decaying for well over a year. The U.S. has been the last holdout showing growth since the beginning of 2018, as most other developed countries suffered slowdowns. 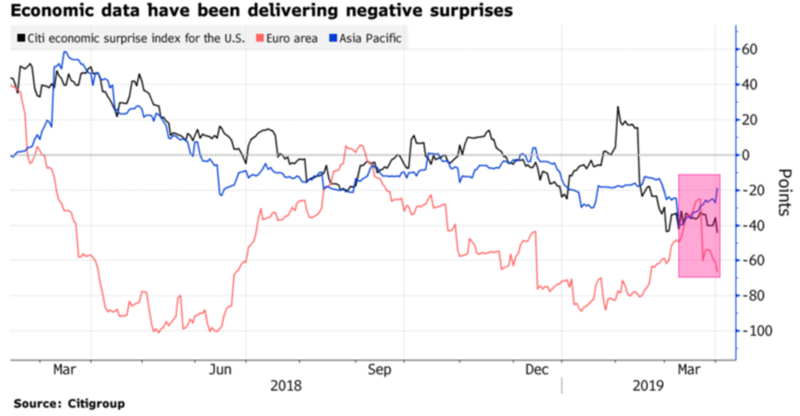 The fourth quarter showed that the U.S. is not immune and appears to be joining the rest of the world in delivering negative surprises. The first quarter has continued that negative trend. But the weakening environment is starting to show itself in the recently announced employment numbers. 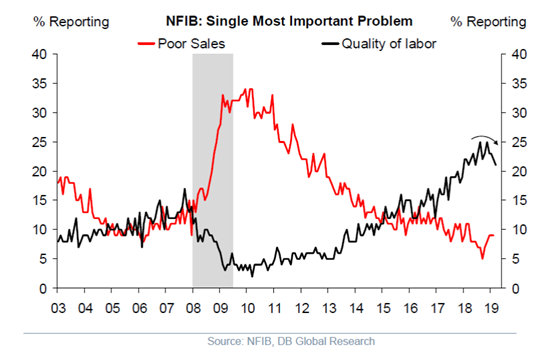 Although the positive trend has been strong, there is growing evidence that employers are less concerned about finding quality labor. It may be that this lack of concern about labor is tied to a new anxiety about poor sales, which has not been of concern for most of the last 10 years. As we have stated in recent newsletters, economic soft patches happen and they are normal. However, our signals are highlighting a notable gap between a weak international economy, a weakening U.S. economy, and the resumption of greed within public investment markets. It could be that the markets are looking through the soft patch and seeing a recovery. Or, it could be that this group mentality will prove temporary. Greed, by itself, is not a material concern. The complacency about volatility, combined with growing instability within major portions of the debt market, is flashing a cautionary sign. 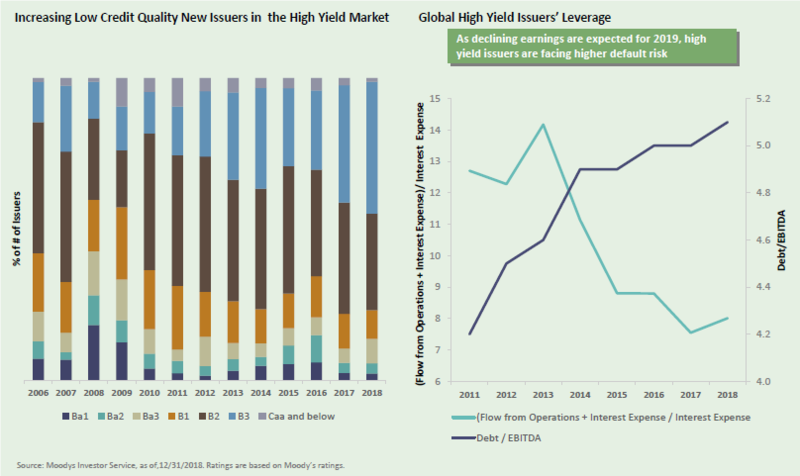 As highlighted in the State Street Global Research charts below, investors have been gobbling up lower quality debt in recent years, while the companies issuing it are doing so with worse fundamentals. And it’s not just corporate debt that’s become increasingly risky. 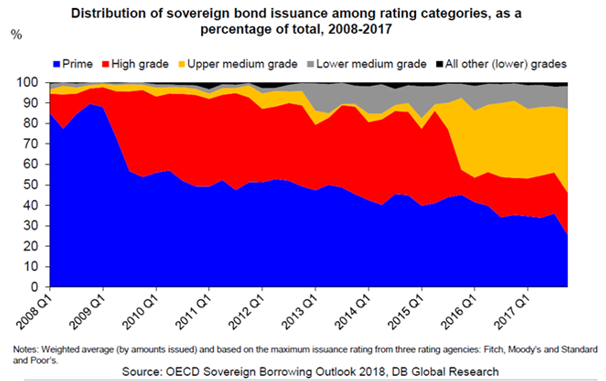 Sovereign debt issuance has been of lower quality. In the case of both corporate and sovereign debt, lower quality means more risk of bankruptcy and a smaller likelihood of recovery, in the event that economic activity becomes less favorable. The fear investors felt at the end of 2018 was quickly forgotten, which has led to a high level of greed in the first quarter of this year. The Groucho Marx quote we opened with reflects today’s group mentality that appears to be gripping the markets. The economic signals we’re seeing, along with the high levels of lower quality debt, are forcing us to wonder if the club we are in is one we want to be in. In our last quarterly commentary, we discussed the need to build a mosaic. That mosaic wasn’t as pretty in the first quarter. Again, we are not expecting it to become a systemic risk that would result in a material and enduring downturn. If we did, we would not have the equity exposure we currently have. However, the signals are concerning and continue to warrant caution. The build-up of lower quality assets combined with the recent robustness in greed is making for an increasingly unstable environment, in our opinion, which means higher levels of volatility, not lower. We continue to sit in a moderately defensive position with higher-than-normal levels of tactical cash. Our weightings lean towards the U.S., as we look to focus our holdings on higher quality assets.